David Munrow had planned to do the classic Play of Daniel..but it was not be. 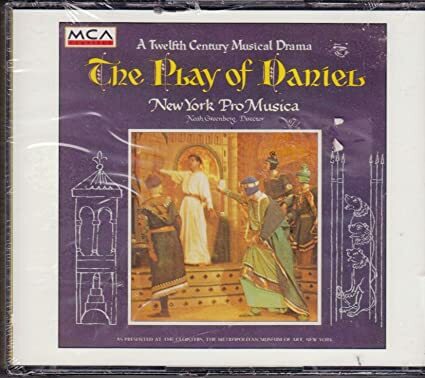 The Play of Daniel, or Ludus Danielis, is either of two medieval Latin liturgical dramas based on the biblical Book of Daniel, one of which is accompanied by monophonic music. Two medieval plays of Daniel survive. The first is one of the plays in the Fleury Playbook, a 13th-century manuscript containing ten liturgical dramas; the text is by Hilarius, and no music accompanies it. The play itself dates from c. 1140. The second is a 13th-century drama with monophonic music, written by students at the school of Beauvais Cathedral, located in northern France. Both plays were completed about 1227 to 1234. A large portion of the text is poetic rather than strictly liturgical in origin; it closely follows the narrative of the biblical story of Daniel at the court of Belshazzar. The latter play was revived in the 1950s by Noah Greenberg, director of the New York Pro Musica; a commentary in English, written and performed by W. H. Auden, was used in some of their performances. A recorded 1958 performance by the group at the Metropolitan Museum of Art, and featuring boy choristers of the Church of the Transfiguration as satraps and soldiers, was released by Decca, with sleeve notes by Paul Henry Lang and Dom Rembert Weakland, O.S.B., who had discovered the text at the British Library. Since the New York Pro Musica production it has enjoyed many performances among early music troupes. Also important in the history of modern revivals of the Beauvais Cathedral version, Daniel was the 1985 production of the Boston Camerata, staged by Andrea von Ramm, with musical direction by Joel Cohen. 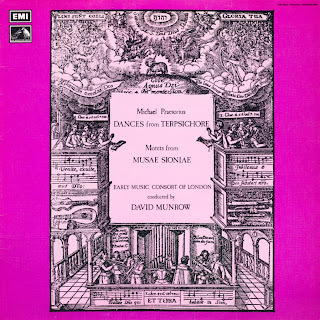 In 2008, The Dufay Collective and William Lyons released their CD, "The Play of Daniel" on the Harmonia Mundi usa label. A new production of The Play of Daniel by The Boston Camerata, this time under the direction of French-born medievalist Anne Azéma, was presented in Boston in November, 2014. Daniel was played by tenor, Jordan Weatherston Pitts. In 2008, a new production, staged by Drew Minter with musical direction by Mary Anne Ballard in commemoration of the 50th anniversary of the noted Cloisters production of 1958, was created, also at the Cloisters. The show has been reprised in subsequent seasons, in 2012 at the Cloisters and in 2013 and 2014 as part of the Twelfth Night Festival at Trinity Church Wall Street. Jump up ^ Eugene, Enrico. "The Play of Daniel: European Music Series". Oklahoma: The University of Oklahoma. Retrieved 2009-11-18. Jump up ^ Joseph Kerman, Contemplating Music. Harvard, 1985, p. 195. Jump up ^ "Play of Daniel: Songs of Peace". Songs of Peace Online. Retrieved 2009-11-18. Richard H. Hoppin, Medieval Music. New York, W.W. Norton & Co., 1978.